NiCK'S SANCTUARY: "Please RT The Heaven out of This"
"Please RT The Heaven out of This"
In case you were wondering, the title of this post is not an ego-driven request, it's a statement mirroring a Twitter post I observed the other day. It's not the first time Gervais has courted controversy for aggressively baiting an individual or group on the Internet and I dare say it won't be the last. This particular series of tweets probably flew under the "outrage radar" because it was perceived as knocking the oppressive religious establishment (I'm not so sure religion has the monopoly on oppression... not by a long chalk). However, I think I understand what motivated his actions on this occasion. Let's put a bit of context into the equation. On the day these tweets came out, Hurricane Sandy was bearing down on the northern states of the American Eastern Seaboard and US pastor John McTernan had posted a blog attributing the blame for the hurricane (and other natural disasters) squarely at the door of those who want to further the gay agenda. This may have stuck in the craw of Gervais who as an ardent atheist must have found it deeply irritating that a group who by and large often deny the scientific theories implying human activity influences climate change, were turning the gun on their own political targets... which he believes to be fuelled by mumbo jumbo. I think whenever Gervais feels he or somebody else he feels as undeserving becomes the recipient of bullying tactics and trolling, he resorts to the same tactic. "And God blessed them and said to them, Be fruitful, multiply, and fill the earth, and subdue it [using all its vast resources in the service of God and man]; and have dominion over the fish of the sea, the birds of the air, and over every living creature that moves upon the earth." Our lives are for rent... and we can't learn to buy (no matter what Dido sings); everything we acquire or build up in this life, once we relinquish it - becomes the property of another. Everything we have on this planet is for our time and we must use it wisely - be it wealth, health or the resources of the planet itself. We have to look after this planet because we don't own it... we just live here by the grace of the One who made it. 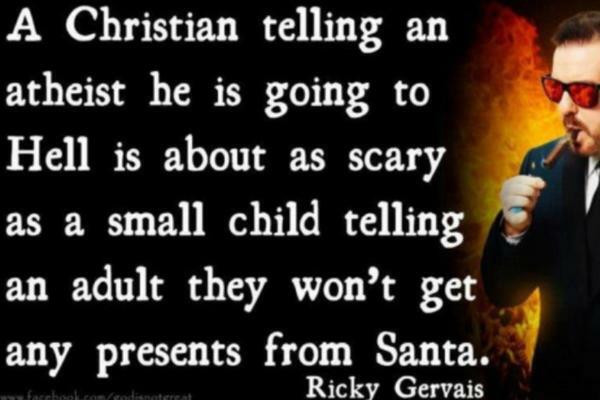 "A Christian telling an atheist he is going to Hell is about as scary as a small child telling an adult they won't get any presents from Santa". The whole barb of that comment relies on the self righteous belief of atheists that their view is superior... that Christians have bought into a fairy story and that when they grow up, they will see the whole tale for what it is and dismiss it as myth. However there's another problem... both the Christians and atheists in question - the messenger and the recipient, happen to have misunderstood the message. In all his teachings, Jesus reserved his deepest warnings for the self-righteous. He never used fear as a weapon. when Jesus is talking to "sinners", He is at his most tolerant... be it the Samaritan woman at the well, Zaccheus, or the woman caught in adultery... Jesus's message is one of love and hope, not threat and damnation. Christians should not be beating up the broken with threats; that IS bullying. It's the Holy Spirit's job to convict the world of sin... not ours. Our duty is to live out holy, Spirit-filled lives that reflect the glory of God... and when people starved of the bread of salvation ask us "why am I hungry" or "where can I get fed", that's when we provide THE answer. You can't batter someone who is resistant to your message into submission... it just doesn't work like that. All you will succeed in doing with that tactic is drive them away in fear or force them to come out fighting in anger... nobody wins. Love s the answer, always has been... always will be. A wise man once told me a parable that illustrated this sentiment perfectly for me. It concerned a wager between the sun and the wind. Seeing a man walking down the road with his hat and coat, both bet that they could make him remove his extra apparel. The wind went first and blew as hard as it could... but no matter how hard it tried, it just encouraged the man to clutch his hat to his head and hold his coat as tightly to himself as possible. The sun took its turn and poured as much of its warmth and light onto the man as possible... overwhelmed by the temperature, the man removed his hat and coat of his own accord and carried on down the path. It's warmth and not force that wins the day. 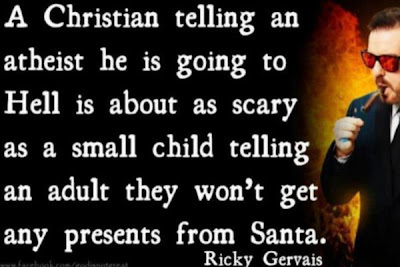 An atheist is like a small child who as he begins to grow up realises Santa doesn't exist* and is either bitterly disappointed and filled with a sense of loss... or shrugs his shoulders and thinks it doesn't matter anyway. Yet this child has not yet matured to the point of realising that for all the tales of Santa there is a very real parent who loves him, wants to provide for him and wants to have a full relationship with him. That parent is God. Far from being the foolish small child making threats to the enlightened, a Christian is the older sibling who understands that when you scratch away the superficiality of religion... you begin to understand that there is a deeper, more powerful truth behind it all - one that you wished your younger brother shared.